Positive Detroit: If You Really Want to Understand Detroit, You Should Probably Go to Buddy's. If You Really Want to Understand Detroit, You Should Probably Go to Buddy's. The city's most famous pizzeria is located at the corner of Conant and McNichols, deep in the heart of the East Side. Buddy's dates back to Prohibition, when a man named Gus Guerra ran the joint as a speakeasy. With money tight and a war on, he added pizzas to the menu, and by the end of the 1940s, everyone knew about his unique, Sicilian-style pies. 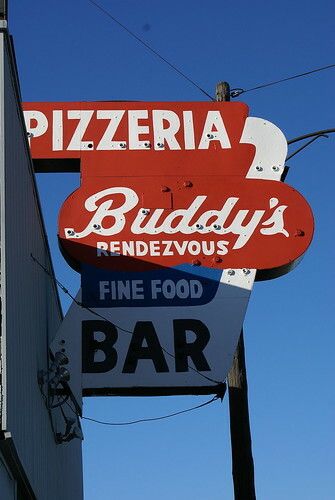 Buddy's has been on this corner for more than six decades, which is a testament to the quality of the pizza. There are many ways to get to Buddy's. Needing to find my way there from the eastern suburbs on an uncharacteristically warm and sunny late spring afternoon, I end up on Seven Mile Road, which, as far as the map goes, looks like a fairly direct route. The weather is fantastic. Just as I'm about to admit to myself and my passenger, a fellow reporter from New York, that this was the Worst. Idea. Ever. and that we should probably just find the nearest freeway on-ramp and get back to civilization, there it is: Buddy's. The former speakeasy still feels very much like a fortress. A couple of bocce-ball courts are surrounded by fences. To enter, you walk down a long tunnel, lined with newspaper clippings that either discuss or honor the legend. Entering a windowless room, a server welcomes us warmly and invites us to take a seat wherever we'd like. We head down to the bar, take a booth and check out the menus. Detroit-style pie is a cousin to the Sicilian slices you can get all over New York, but made with twice the attention to detail. After all these years, it remains elegant, a light, sugarless crust with not too much mozzarella and a fragrant tomato-basil sauce on top. The dearth of liquid around the edges allows the cheese to bake into the porous crust, a crispy little miracle that you never really lose a taste for once you've tried it. A small pie; four sizable squares, costs just a few bucks. It's pretty spectacular stuff; I eat a whole pie on my own. "How'd you like the pizza," says our waitress, a gentle, middle-aged woman. Hated it, we say, pointing to two empty pans. She laughs. On our way out, a couple more staff members stop us to say goodbye. They thank us for coming. "I heard you hated our pizza," says one, smiling broadly. "Next time, we'll try harder." Outside, I start snapping pictures, standing near a dark-green Range Rover, windows down, the bass thumping, unfamiliar snatches of hip-hop providing a rather nervewracking soundtrack as I make my way around the intersection. Out of the corner of my eye, I can see a man flying at me from across McNichols Road. He's waving something in his right hand. Engine oil, he shouts, out of breath. The real deal. Can he hook me up? Behind me, I notice that my colleague, Justin, has been drawn into conversation with a lanky young man in a long yellow T-shirt, his eyes hidden by sunglasses. Why are we here, he wants to know. Where are we from? New York, we say. We're here for pizza. Satisfied with this information, the young man insists that we take his picture in front of his car, which turns out to be the thumping Range Rover. It's parked up against the wall, on which they've painted a big sign denoting Buddy's status as one of the Food Network's favorite pizzerias in the United States. Our new friend sends the engine-oil man back across McNichols, where he came from, pulls Justin to him and grins for the camera. "Now," he says, "you may get really drunk tonight and forget everything you saw in Detroit today, but you won't forget Buddy's." It has now been nearly ten years since I first laid eyes on Detroit, and the one thing I learned almost immediately is that you never know who you are going to meet, where you are going to meet them, how it's all going to play out and how many other people you will be introduced to before the day is over. In other words, don't make a lot of plans. Detroiters, quite simply, are people people. No visitor ever need be a stranger here, unless they want it that way. Stick around and, pretty quickly, you'll be longing for the day when you could just sneak around without being recognized. Most of the time, you don't even need introductions -- simply showing up makes you part of the gang. Everyone wants to know how you got there. At times, you feel like you're in a small town in Japan, except there are fewer schoolgirls pointing at you and giggling. Something as simple as going for coffee in the city's Mexicantown neighborhood once turned into a half-hour chat with the proprietor, who moved here recently from Barcelona. Each time I stop by, I'm not just getting a double espresso -- I'm going to see a friend. Everywhere you go in Detroit, you automatically have one thing in common with the people around you: You're here and alive and making the best of a city that so many people long ago left for dead. As conversation starters go, it doesn't get much better than that. GOOD GOVERNMENT, NO. CREPES, YES. Nicole Rupersburg writes about food, which, along with drinking, is one of the major local pastimes. Her blog, Dining in Detroit, covers the local scene, a scene that surprises most people when they first visit. I join her for a walk through Southwest Detroit, where she's working on a feature about taco carts in this predominantly Mexican neighborhood. Rupersburg, a child of the suburbs, lives in a landmarked historic district designed by Mies van der Rohe, just steps out of the downtown core. She lives cheaply, like most young people do in the city, renting an apartment for a few hundred dollars a month, working a day job to support her writing habit. Somewhere between the stellar carnitas taco from a truck off of Vernor and a tasty torta con chorizo served hot off the grill in the parking lot of a gas station, we start talking about how, even here, city life can be genuinely stimulating. "At a certain point," says Rupersburg, "you stop getting riled up about what's wrong with Detroit and just start living." You'll find people like her all over the city. People who didn't move into the city because they wanted to save it, but simply because it appealed to them. Then, of course, there are the people who grew up here, had the chance to move away, but came back. Torya Blanchard used to teach French in a local charter school. She's a lifelong Detroiter except for a stint in France. Today, she operates a small creperie out of a window on John R Street in the heart of the city's attractive Downtown, whose only real sin is being grossly underutilized. I sit down with Blanchard on the rooftop deck of the Park Shelton building in Midtown, a former hotel across from the Detroit Institute of Arts. It was once owned by Gilda Radner's father. Diego Rivera and Frida Kahlo lived here for a time. W.C. Fields also once slept here. Blanchard is preparing to open a second location of her creperie, Good Girls Go To Paris, on the building's ground floor. A bookstore, Leopold's, is slated to take up residence next door, joining an existing Korean restaurant. "People tell me I'm courageous, taking a chance like this," she says. "I'm not courageous at all. I'm fed up." In Blanchard's opinion, the economic outlook for the region isn't all that worrying, even if she admits that she doesn't know whether or not she'll survive. Still, she knows this much: She's done talking about Detroit's future. "I'm sick of talking about what we're going to do," she says. "Just do it." Being happy hour at this point, we retire to the nearby Book Cadillac Hotel, the tallest in the world when it was built back in the 1920s, and today a proud beacon of Detroit's past greatness. Here, the elegant 24 Grille is currently offering a small plates menu, $5 each. Blanchard orders a glass of champagne and, of course, introduces me to at least three different people, one of them a home owner in the city's historic Boston-Edison district, a collection of some of the most spectacular examples of residential architecture standing in the United States today. Henry Ford lived here in the early days of Model T production; Motown Records founder Berry Gordy lived just a couple of blocks over, decades after that. Perhaps the lack of barriers and the subsequent connections you make here on a daily basis are all simply due to the fact that in a city this tormented, the locals have figured out a secret that many Americans never do: Community matters. You'll often hear Detroiters referring to their home as a small town trapped in the body of a big city. The following evening, the downtown riverfront is swallowed up by the crowds attending the Movement festival, an annual celebration of electronic music in the city that created techno. The festival, which gets better each year, draws followers from around the globe. I ditch the car and walk down Griswold Street, past the exuberant Guardian Building and down to the Detroit River, where DJ Carl Cox is in the middle of a set loud enough to rattle the General Motors headquarters off its foundations. A gentle breeze is blowing off of the river. Working on the first drink of the evening and caught up in the tornado of people and energy and color, I think to myself, as I always do when I'm here: If only people knew what they were missing. 2) THE SPACE The half-empty city can be a cyclists's dream; rent a bike from Wheelhouse Detroit and explore the ever-improving riverfront. Crowds? What crowds wheelhousedetroit.com? 3) THE BEER Michigan is brew heaven -- locally, it's all about Motor City Brew Works in Midtown. Must try: Ghettoblaster Ale (470 W. Canfield St.). 5) THE PIZZA When GQ magazine recently named the top twenty-five pizzas in the U.S., four of the winning pies were from Metro Detroit. Start at Buddy's, the spiritual home of Detroit-style pie (17125 Conant Ave.). 6) THE MUSIC Detroit has a long list of musical success stories; the region remains a breeding ground for interesting talent. Find out who's hot, what's next and who's playing where at eatthiscity.com. 7) THE ART The Detroit Institute of Arts is home to Diego Rivera's impressive Detroit Industry murals, plus a film theatre and a highly regarded permanent collection. For art lovers, this museum alone is worth a trip dia.org. 8) THE TEAMS The Red Wings may have lost the Stanley Cup and the Lions are still in the hall of shame, but hey -- how about them Tigers? 9) THE NIGHTLIFE If you can't find a bar that suits you in the city, you've either recently quit drinking or have forgotten how to have fun. 10)THE PARK Detroit's Belle Isle Park is an Olmsted-designed island in the middle of the Detroit River. Make sure to hit the beach, where there's a spectacular (and affordable) water slide.